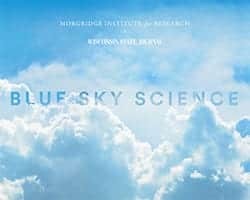 News & Stories > Blue Sky Science > Why do fresh cheese curds squeak? Blue Sky Science: Why do fresh cheese curds squeak? When cheese is manufactured, the milk is clotted and some of the water removed. You end up with a curd, a tough structure where the proteins in the cheese form a mesh. That mesh is held together with calcium which makes it tough. When you bite into a cheese curd, the tough mesh resists you biting through it. That resistance causes the curd to squeak because it’s rubbing across your teeth. With age – even just one week – that calcium dissolves from the protein making the protein softer. At that time, you chew it and there’s no friction, so the squeak is lost. Putting the curd in a microwave oven causes the proteins to re-form and get tough again. Then, just as before, when you bite it the tough structure resists, and the squeak returns. If you take a cheese curd and let it sit in your refrigerator for two months, something different happens. That protein starts to break apart because of an enzyme used in cheese making. When that happens, no matter what you do, the proteins will never re-form. It will remain soft and there will be no squeak. So how do cheesemakers maintain a squeaky cheese curd if it’s shipped across the country? They freeze them. If a curd is frozen, it can thaw out in California or Texas and retain the necessary structure—and the squeak—for about another two weeks. How can milk make so many different products? How is a gummy bear made?